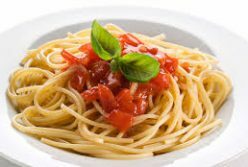 One of the most delicious Italian dishes containing a marvellous blend of spices, while it could be served in just over an hour. Perfect for guests or surprising the family with a special meal. The one pan meal offers crispy crust chicken and can be served immediately. 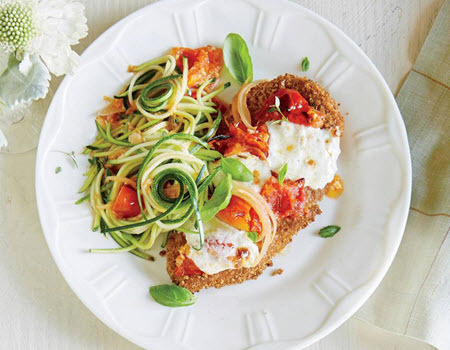 Chicken Parmesan with Zucchini pasta also goes well with homemade garlic bread or with a fresh green salad. Some Italian seasoning over the zucchini and fling to coat. Rest the colander over a bowl until most of the water from the zucchini is drained. Coat a non-stick skillet with cooking spray and place over medium-high heat. Cook chicken in the hot skillet until browned and no longer pink in the centre, which should take around 4 to 5 minutes per side. Next transfer chicken to the prepared baking sheet. Stir and cook until tender but still firm to the bite, which would take up to a maximum of 4 minutes. Add marinara sauce over each of the chicken breasts and top with mozzarella cheese. Place the chicken pieces in a preheated oven until such time as the cheese is melted, which will take about 1 to 2 minutes.